There are already quite a few plugins available in the Moodle community plugins database, so I have started to install and review the plugins. The review will be an overall usability review and not at all focused on the technical side. This module enables the teacher to create and manage sessions for the Adobe Connect Pro Virtual Classroom system from within Moodle 2.0. This module enables the student to download a a course certificate when they have completed the requirements. This module enables the teacher/trainer to monitor and track the students progress as they tick off the different items on a course specific todo list. This module a nice intuitive interface for managing the workings of a committee members, events, files and meetings agendas. This activity enables easy integration between Moodle 2.0 and the virtual conferencing system BigBlueButton. This is a Moodle activity plugin which is an alternative option to the standard Forums within Moodle. This activity allows students to select the group that they want to be members of. 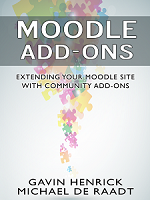 This is a Moodle activity plugin which is an alternative wiki option within Moodle. It has been designed specifically with teaching and learning in mind. This activity enables integration between Moodle 2.0 and the open source OpenMeetings virtual classroom system. This module provides an easy way of creating your own surveys using a range of question types. A schedule tutoring sessions module for Moodle, where teachers and students can make appointments for tutoring interviews from a timetable view. This activity enables a comprehensive integration between the web conferencing platform WizIQ and Moodle. Currently when a teacher wants to get a complete list of all work to be marked, there is no way to get a complete list of every submission without going into the courses. This block solves that issue. When you place this block on the front page, the teacher is then shown all of the unmarked work that has been submitted by students in their courses. The Course Contents Block provides an alternative in-course navigation for teachers and students, displaying the topic names in a easy to use menu. The Course Menu Block provides an alternative in-course navigation for teachers and students, which increase the functionality of the overall navigation. This block enables the user to create custom reports for viewing in Moodle and for downloading into Excel. The Drag and drop file upload for Moodle 2.0 provides a great time saving and easy way to upload files into a Moodle 2 course. This block provides a nice and simple E-Portfolio option for students within Moodle. The Lesson Objectives block provides a way of creating learning objectives aligned to the lesson timetable. Each one then appears in the block and can be ticked off by the teacher. The Progress Bar provides a colour coded progress visual for students to help them manage their time while completing a course. The Simple Clock block shows the server time, and the users times on a block on the course page. The user info block provides an easy way of navigating around some key parts of Moodle 2 for the user. This block allows students to privately email the teacher of their course. This block displays a list of unanswered discussions from the course forums. The format loads all of the topic into slides which you can then navigate freely through without reloading the page again, as you would have to if you used topics and focused on one of them. The OneTopic course format presents the existing topics from a topics format course one at a time.. The topic names are shown above the topic content in tabs and each topic can be showed one at a time by clicking on the correct tab. It also keeps the focus on that one topic even when going in and out of resource/activities in the course. The Collapsed Topics course format takes the existing topics from a topics format course, and presents them in a more compact view. The topics names are shown in a list and each topic can be toggled â€œopenâ€ or in its default closed or hidden state. This plagiarism plugin searches the web and the moodle site for similar content. This admin report enables users to create reports from SQL and view the results on the webpage and export the results to spreadsheet. This plugin blocks multiple sessions for one user account. The integration for Respondus and Moodle 2 is a web service plugin which enables the tool talk directly to Moodle 2. This resource provides an easy way to create multi-page resources with a book-like format and navigation. This excellent resource type provides a way to create a slide show presentation within Moodle. This question type enables the student to answer the question by placing a marker or multiple markers onto the image that the question is using. Is it well coded and secure? Will it impact on server performance? I will leave these for someone else to tackle, but if you are considering installing a module please look at those issues as well as usability. If you find any inaccuracies or mistakes in the reviews, please let me know! I’m still waiting to see what you have to say about ForumNG, OU wiki, OU blog and Subpage. Actually I had partially finished review on ForumNG, so will finish now, and line the others up for coming week along with a multi-part review of ELIS for Moodle 2 that I am starting.